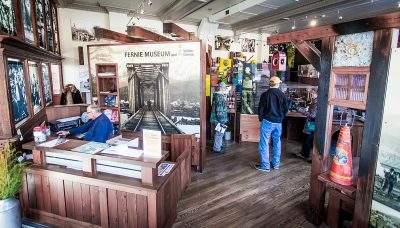 When we embarked on the design of the civic history exhibit for the Fernie Museum and Visitor Information Centre, we had no idea that we would be tackling a history fraught with disaster. The founders of Fernie survived multiple fires that burnt the city to the ground, mourned the loss of their citizens in mine explosions, and responded to avalanches that buried everything in their path. And that was just the beginning of the story! But in the face of these travails, a beautiful mountain town came to be known for some of the best powder a skier could dream of, all nestled in a harsh and remote spot of the Rocky Mountains. So when the museum opened its doors this September, we breathed a sigh of relief that disaster sat on the sidelines for a day while the citizens celebrated their resilience and dedication the way they do best: working hard and playing hard!